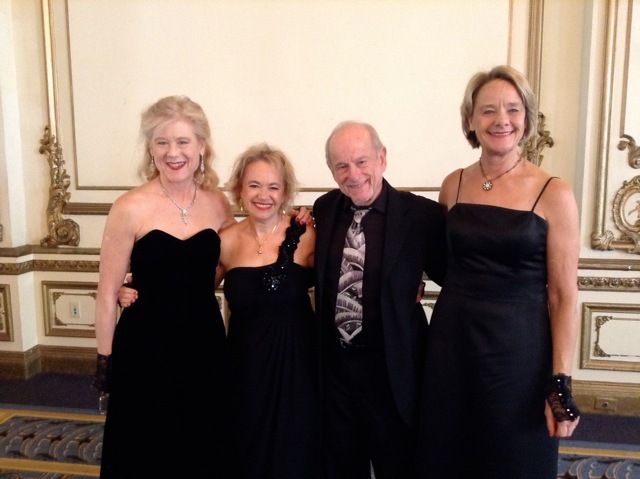 We had an elegant time yesterday entertaining the SF Breakfast Club at the historic Fairmont Hotel. This was a return engagement for us and everyone seemed to be delighted with our performance with our accompanist Dave Austin. Celebrating the New Year with a show! 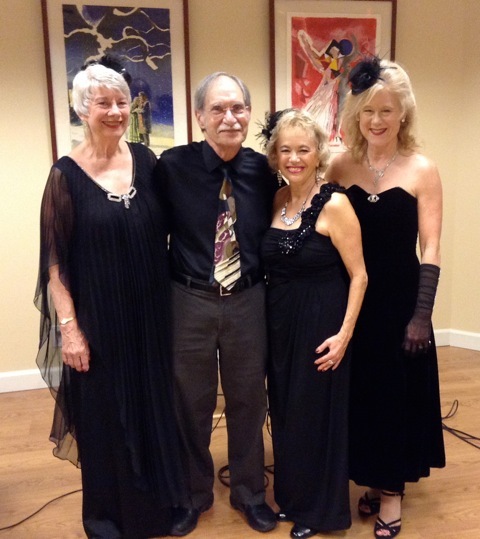 We had a great time with our terrific band ( Dave Austin-piano, George McNeil - acoustic upright bass, and Elliott Bein, clarinet) New Year's Eve presenting a two-hour show to an upscale senior audience We wore our evening gowns and lots of bling, and trotted out our boas and fascinators and sailor hats, for a few different numbers each, and got rave reviews from many of the. residents. We've already been told we're going to be invited back! Lovin' Harmony had fun sitting in and doing a couple of tunes at Mardi's solo gig at the charming Panama Hotel Restaurant. Whew...Three Shows in 24 Hours! On Sunday we were the featured entertainment at a festive holiday banquet celebrating the achievements of the volunteers for Sutter Care at Home in Santa Rosa who raised over 2.5 million dollars this year to provide hospice services for low income people. They billed the event as "Celebrate the USO Way" so we wore our red, white and blue sailor dresses. 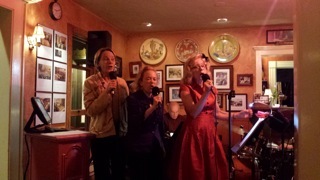 We had the crowd singing along and a few even got up to swing dance to "In the Mood". The producer of the event was very pleased with our performance and says she definitely wants to have us back for the event next year! We're having a little break from performing before we jump back in with three shows next weekend. Meanwhile we are rehearsing with a new accompanist for our holiday shows. Judy has been hard at work booking us gigs for next year. We've already lined up eleven shows ! 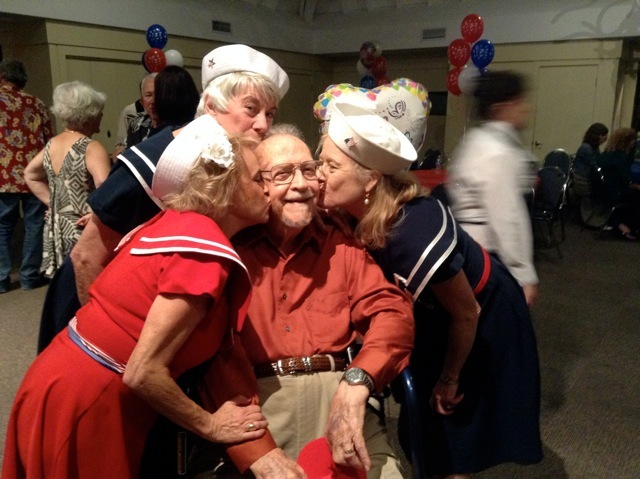 Lots of Fun Celebrating a 95th Birthday! We had lots of fun today bringing age-apprpriate music to the birthday party of a charming 95 year old WWII Vet. We quickly whipped up an addition to our repertoire in order to sing "Blue Moon", his favorite song. Chris, Judy, and Mardi enjoyed returning to the Veterans Home of California in Yountville, under the auspices of Bread & Roses, to present an hour-long show of WWII era tunes to the service men and women. Afterward, many expressed their appreciation. It's always gratifying to bring smiles to the faces of people who sacrificed on our behalf. We made such a good impression last night at Villa Marin that we are in discussion about returning for a New Year's Eve show! We drew a large, enthusiastic (and generous) crowd today for our return engagement at Town Center Corte Madera Summer Music Festival. There were folks in the audience (who were neither friends nor relatives ) who came up afterward to tell us they had made a point of coming back to see us after enjoying our show last year! Lots of old friends and fellow musicians also showed up to support us and enjoy swing-era tunes on a beautiful sunny afternoon. We donned our new cowboy hats to perform the newest addition to our repertoire, "Choo, Choo, Ch'Boogie", in a Western Swing arrangement. It was a hit! We are delighted to announce that our next two Lovin' Harmony Trio shows are OPEN to the Public! Our local friends, family, and fans have been asking for an opportunity to see us perform live, so here's your chance. 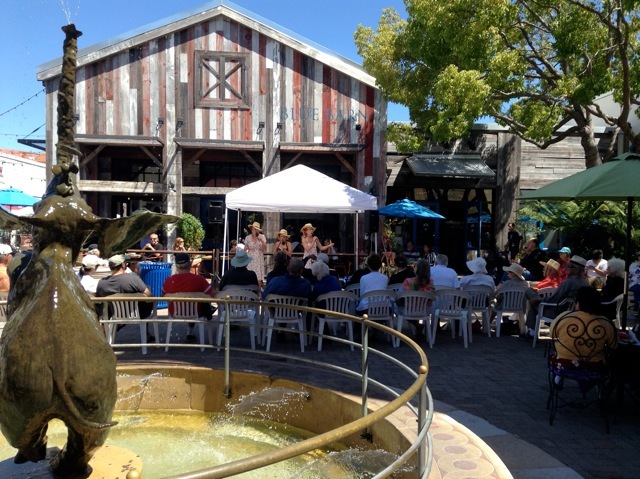 Then on Sunday, August 17 from 2-4 PM we will be the featured artists at the Summer Music Series at Town Center Mall in Corte Madera. The event is FREE and we will sing two sets. Hope to see you at one or the other of these!